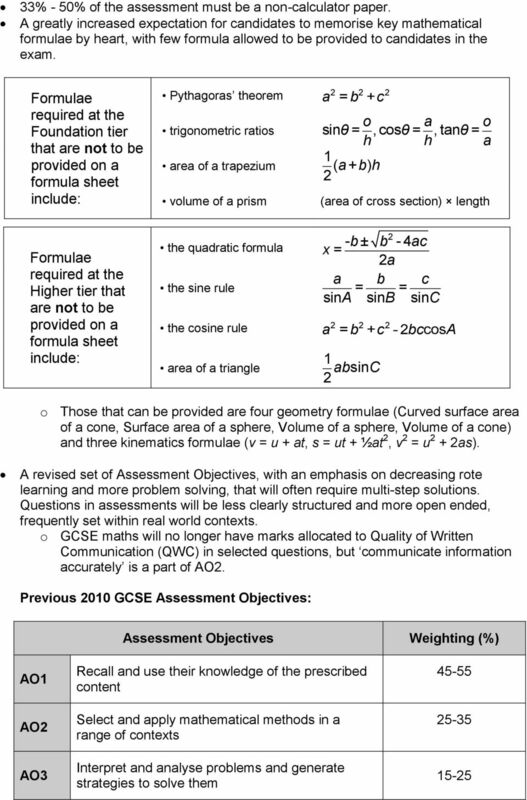 Download "Changes to GCSE assessment across subjects"
1 OCR GCSE Mathematics (J560) now accredited ocr.org.uk/gcsemaths Introducing the new Mathematics GCSE for first teaching from 2015 In February 2013, the Secretary of State for Education Michael Gove wrote to Ofqual asking them to implement changes leading to new GCSEs. We now know that, for first teaching in September 2015, we ll have reformed GCSEs in Maths and English followed by more subjects for first teaching a year later. We ve been busy developing specifications to engage and enthuse you and your students, and working hard to create high-quality resources. 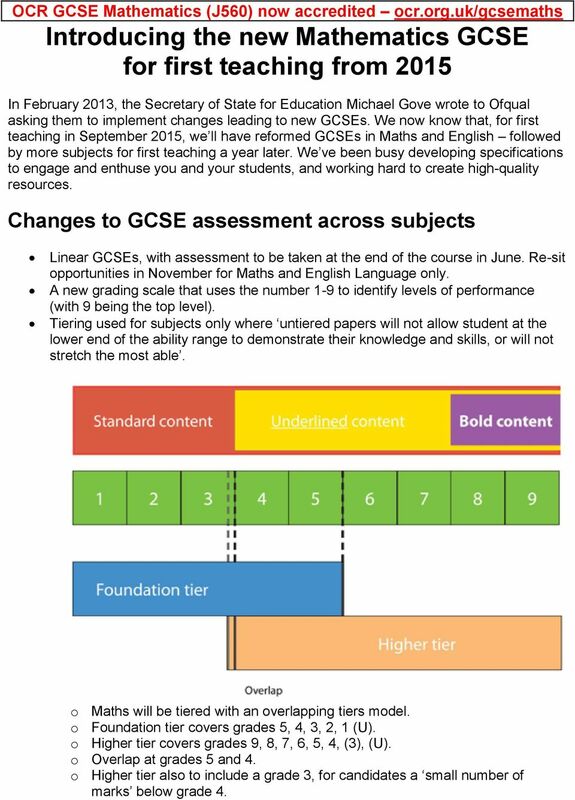 Changes to GCSE assessment across subjects Linear GCSEs, with assessment to be taken at the end of the course in June. Re-sit opportunities in November for Maths and English Language only. A new grading scale that uses the number 1-9 to identify levels of performance (with 9 being the top level). Tiering used for subjects only where untiered papers will not allow student at the lower end of the ability range to demonstrate their knowledge and skills, or will not stretch the most able. 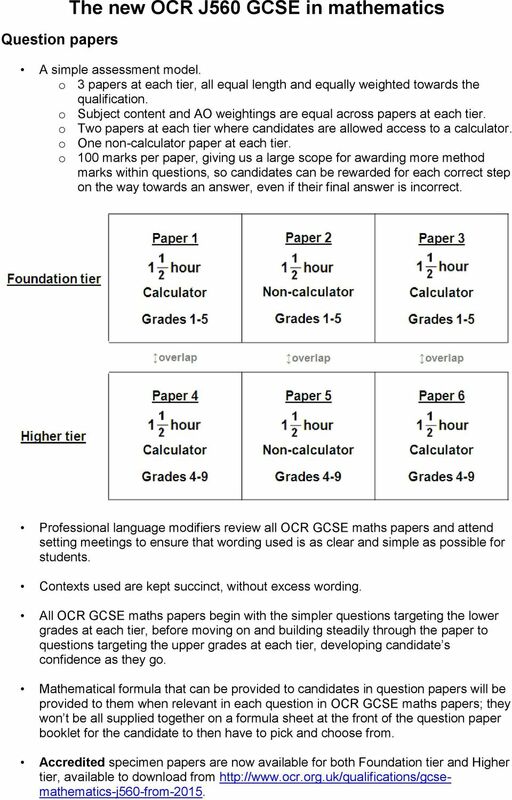 o Maths will be tiered with an overlapping tiers model. o Foundation tier covers grades 5, 4, 3, 2, 1 (U). 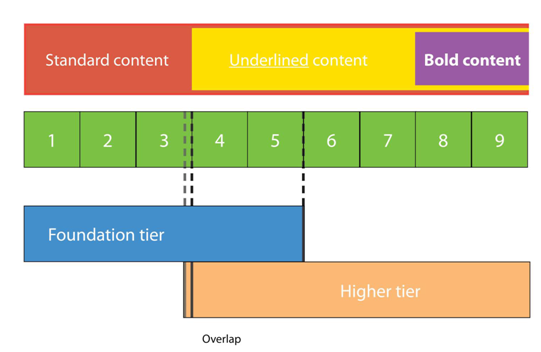 o Higher tier covers grades 9, 8, 7, 6, 5, 4, (3), (U). o Overlap at grades 5 and 4. o Higher tier also to include a grade 3, for candidates a small number of marks below grade 4. 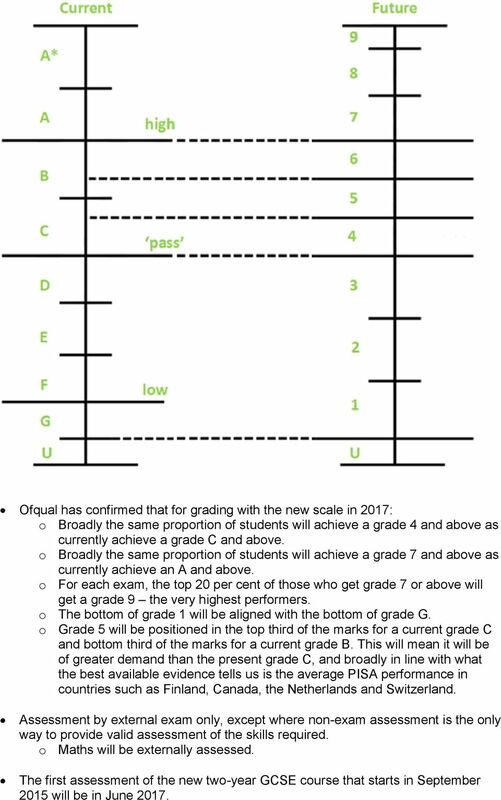 2 Ofqual has confirmed that for grading with the new scale in 2017: o Broadly the same proportion of students will achieve a grade 4 and above as currently achieve a grade C and above. o Broadly the same proportion of students will achieve a grade 7 and above as currently achieve an A and above. o For each exam, the top 20 per cent of those who get grade 7 or above will get a grade 9 the very highest performers. 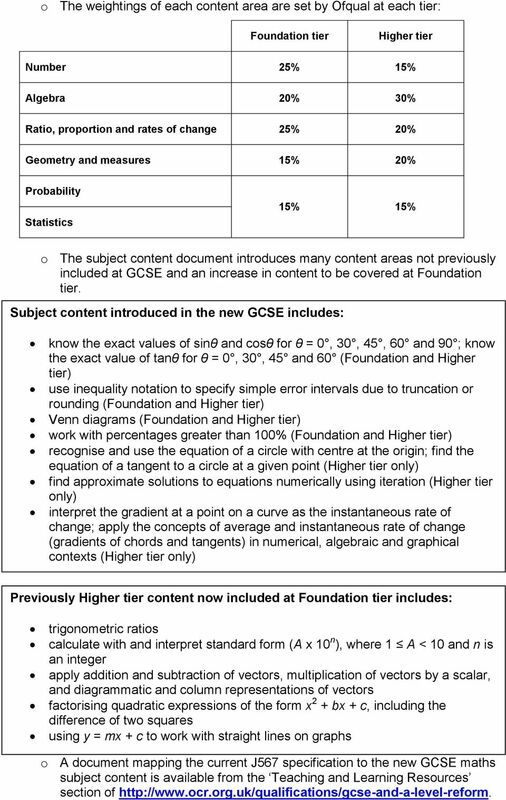 o The bottom of grade 1 will be aligned with the bottom of grade G. o Grade 5 will be positioned in the top third of the marks for a current grade C and bottom third of the marks for a current grade B. This will mean it will be of greater demand than the present grade C, and broadly in line with what the best available evidence tells us is the average PISA performance in countries such as Finland, Canada, the Netherlands and Switzerland. Assessment by external exam only, except where non-exam assessment is the only way to provide valid assessment of the skills required. o Maths will be externally assessed. 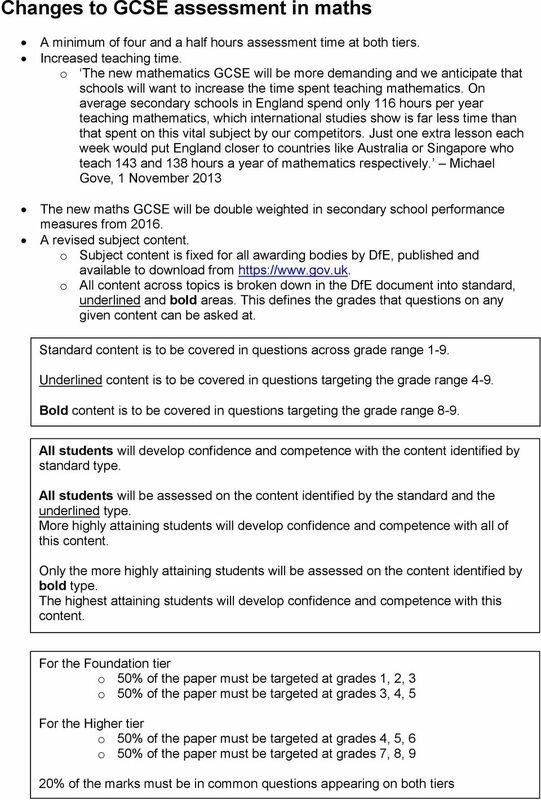 The first assessment of the new two-year GCSE course that starts in September 2015 will be in June 2017. 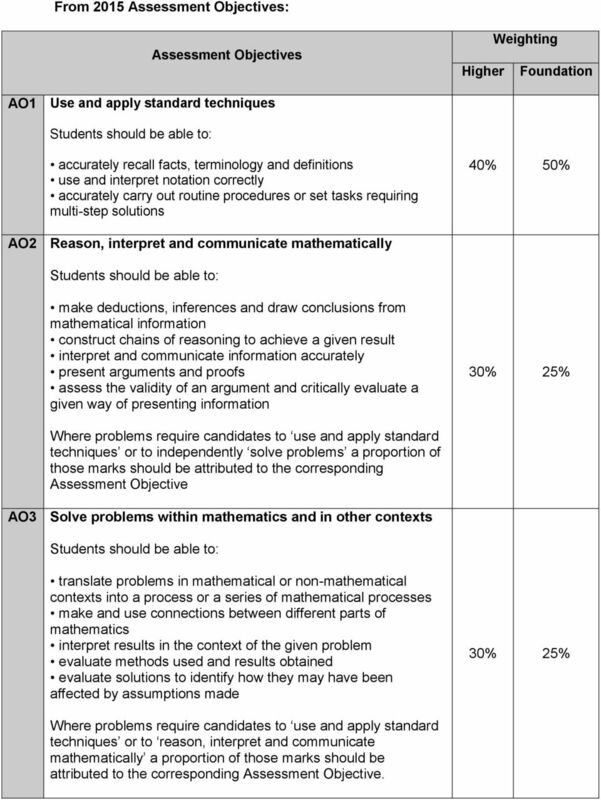 6 From 2015 Assessment Objectives: Assessment Objectives Higher Weighting Foundation AO1 Use and apply standard techniques Students should be able to: accurately recall facts, terminology and definitions use and interpret notation correctly accurately carry out routine procedures or set tasks requiring multi-step solutions 40% 50% AO2 Reason, interpret and communicate mathematically Students should be able to: make deductions, inferences and draw conclusions from mathematical information construct chains of reasoning to achieve a given result interpret and communicate information accurately present arguments and proofs assess the validity of an argument and critically evaluate a given way of presenting information 30% 25% Where problems require candidates to use and apply standard techniques or to independently solve problems a proportion of those marks should be attributed to the corresponding Assessment Objective AO3 Solve problems within mathematics and in other contexts Students should be able to: translate problems in mathematical or non-mathematical contexts into a process or a series of mathematical processes make and use connections between different parts of mathematics interpret results in the context of the given problem evaluate methods used and results obtained evaluate solutions to identify how they may have been affected by assumptions made 30% 25% Where problems require candidates to use and apply standard techniques or to reason, interpret and communicate mathematically a proportion of those marks should be attributed to the corresponding Assessment Objective. 9 Supporting you all the way We recognise that the introduction of a new specification can bring challenges for implementation and teaching. Our aim is to help you at every stage and we're working in close consultation with teachers and other maths experts from a variety of fields to provide a practical package of support to help you make the change. For a start, we ll provide a range of free, high-quality creative resources, which we are currently developing in conjunction with teachers and through research by Cambridge Assessment. 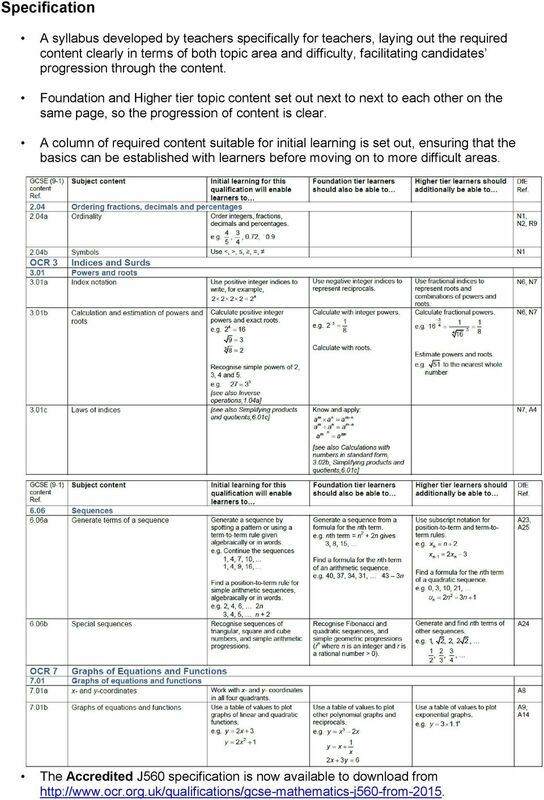 These will take students from KS3 learning right the way through GCSE and can be adapted as required by teachers and shaped to their students needs. Tailored to the needs of each subject, their focus is on supporting creative teaching approaches and progression for all students. We see our resources as a body of knowledge that will grow throughout the lifetime of the specifications, built on the best practice we ve identified from our discussions with the teaching community since the reforms were announced. We ve now published an initial sample of our new resources for the qualifications currently being redeveloped for first teaching in 2015 and these are now available to download from Along with subject-specific resources, you ll also have access to a flexible teachers support package, formed through listening to teachers needs, allowing teachers to easily understand the requirements of the qualification and present the qualification to students. Skills guides - we have produced a set of Skills Guides that are not specific to maths, but cover a topic that could be relevant to a range of qualifications - for example communication, legislation and research. Active results - a free online GCSE results analysis service to help you review the performance of individual students or your whole school. It provides access to detailed results data, enabling more comprehensive analysis of result in order to give you a more accurate measure of the achievements of your centre and individual students. Why choose OCR? Choose OCR and you ve got the reassurance that you re working with one of the UK s leading awarding bodies. Our new GCSE Mathematics qualification has been developed in consultation with teachers, employers and higher education to provide students with a qualification that s relevant to them and meets their needs. We re part of the Cambridge Assessment Group, Europe s largest assessment agency and a department of the University of Cambridge. Cambridge Assessment plays a leading role in developing and delivering assessments throughout the world, operating in over 150 countries. We work with a range of education providers, including schools, colleges, workplaces and other institutions in both the public and private sectors. Over 13,000 centres choose our A Levels, GCSEs and vocational qualifications including OCR Nationals, NVQs and Basic Skills. We believe in developing specifications that help you bring the subject to life and inspire your students to achieve more. They re designed to be straightforward and accessible, so you can tailor the delivery of the course to suit your students needs. 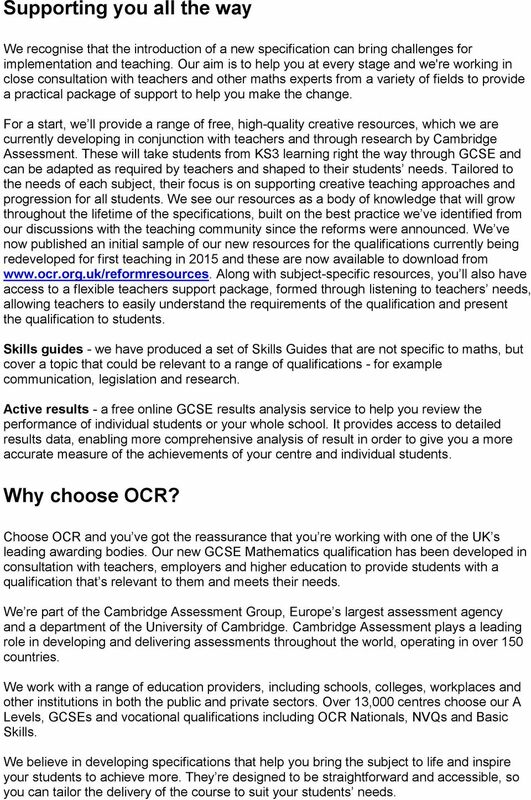 10 Why choose OCR GCSE Maths? It s worthwhile Research, international comparisons and engagement with both teachers and the wider education community have been used to enhance the reliability, validity and appeal of our assessment tasks in Mathematics. It s student-focused Our syllabus and assessment will consist of maths fit for the modern world and presented in authentic contexts. It will allow students to develop mathematical independence built on a sound base of conceptual learning and understanding. We ll target support and resources to develop fluency, reasoning and problem-solving skills. It will be a springboard for future progress and achievement. It s teacher-centred We ll provide clear communication about the changes and an extensive teacher support package, including high-quality flexible resources, particularly for the new subject areas and Assessment Objectives. Our support and resources will focus on empowering teachers, exploring teaching methods and classroom innovation alongside more direct content-based resources. 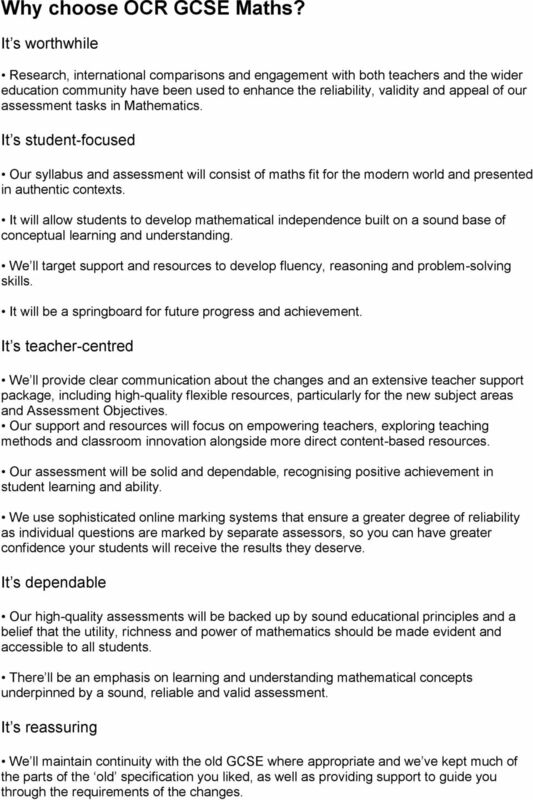 Our assessment will be solid and dependable, recognising positive achievement in student learning and ability. We use sophisticated online marking systems that ensure a greater degree of reliability as individual questions are marked by separate assessors, so you can have greater confidence your students will receive the results they deserve. It s dependable Our high-quality assessments will be backed up by sound educational principles and a belief that the utility, richness and power of mathematics should be made evident and accessible to all students. There ll be an emphasis on learning and understanding mathematical concepts underpinned by a sound, reliable and valid assessment. It s reassuring We ll maintain continuity with the old GCSE where appropriate and we ve kept much of the parts of the old specification you liked, as well as providing support to guide you through the requirements of the changes. Warm up. Connect these nine dots with only four straight lines without lifting your pencil from the paper. number and and algebra TopIC 17 Polynomials 17.1 Overview Why learn this? Just as number is learned in stages, so too are graphs. You have been building your knowledge of graphs and functions over time.